For those of you attending VMworld 2015 San Francisco, as of July 21st, you can now pre-register for the sessions you plan to attend. Now that I've been asked to speak at VMworld this year, I've learned the importance of having session descriptions in on time. With pre-registration, folks can hopefully spot your presentation topic abstract among the sea of other presentation and help get an appropriately sized room assigned. I don't often share much about my day job at IBM, and I don't plan to start regularly advertising what I do on this 99% personal blog. That said, if a demonstration of the amazing benefits of VVols are your thing, you may want to stop by and see what IBM has to offer, featuring me doing a live VVol demonstration! 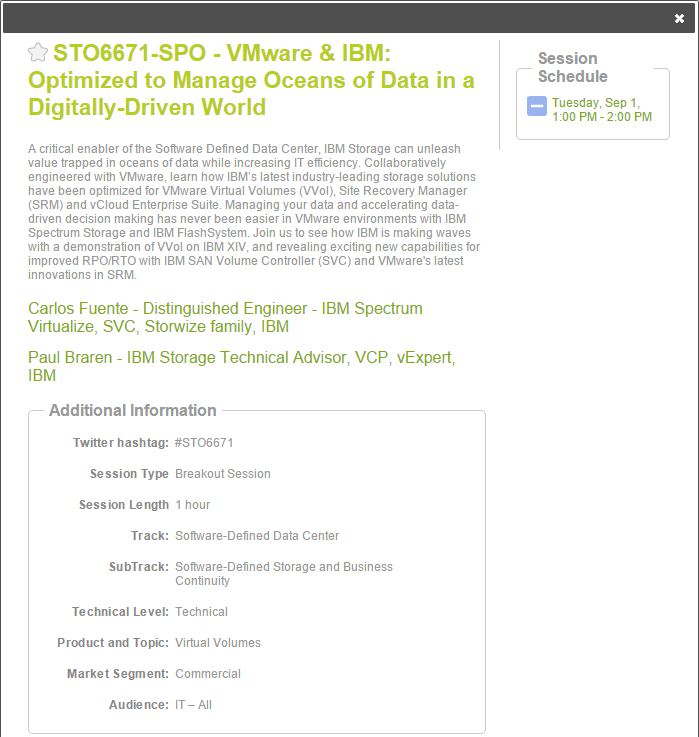 If you'll be at VMworld, and you are interested, please consider signing up for "STO6671-SPO - VMware & IBM: Optimized to Manage Oceans of Data in a Digitally-Driven World" early, to get the chance to see Carlos Fuente and I presenting on September 1st at 1pm-2pm.